SAVE A LIFE Corporation, offers a specific medical training course for First Aid, CPR, AED Instructor training. This course is taught by one of our medically experienced and professionally trained staff. We can train your staff on-site or you can attend this course at one of our upcoming scheduled times located around the Twin Cities area. Individuals are also welcome at any of our scheduled training courses. Instructors credentialed by regulatory authorities to teach First Responder, EMT, paramedic, firefighter, law enforcement, and nursing or medical programs. Pre-requisite: Complete the AHA CORE Instructor program with certificate prior to the instructor course. Instructor candidates will learn how to conduct ECSI courses, including how to use effective teaching techniques, how to demonstrate skills, and how to evaluate participant performance. Instructor candidates can be trained as instructors at the community first aid, CPR, and AED level, as well as at the professional level. 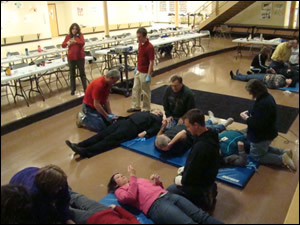 Those desiring to become instructors at the professional level for courses such as Bloodborne Pathogens, Advanced First Aid, Wilderness First Aid, or Professional Rescuer CPR must possess additional expertise in these areas. After completing this course, instructor candidates must teach their first course while being monitored by an IT in order to complete their credentialing as an ECSI instructor. Course Completion Card valid 2 years. Requirement; instruct 2 courses per year to remain current.